This post contains spoilers so if you don’t want to know, come back later. I don’t usually write about movies because quite honestly, I don’t watch many movies. I rarely go to theaters and I still haven’t seen Pulp Fiction, Blow, Trainspotting or even Star Wars. But The Beauty and the Beast opened this weekend, so I made an exception. Maybe it’s because I’ve watched the original well over a hundred times, but I wasn’t as happy with the result as most people. However, that doesn’t mean I think it’s trash. In fact, there are plenty of things that I love about the movie, but the aspects that irritate me really irritate me. And yet, not one review that I have read has mentioned any of these differences. In fact, most reviews say that this remake adheres too closely to the original. I find it to be the opposite. But then again, I have a Beauty and the Beast puzzle hanging in my living room, so maybe the differences are a bit more obvious to me. So let’s start with the good. The animation. The animation is superb. It can’t be an easy task to recreate an enchanted castle, but the artists manage to bring it to life. The castle is stunning, the characters look as realistic as they possibly can, and the rose is beautiful. The rose rattle. 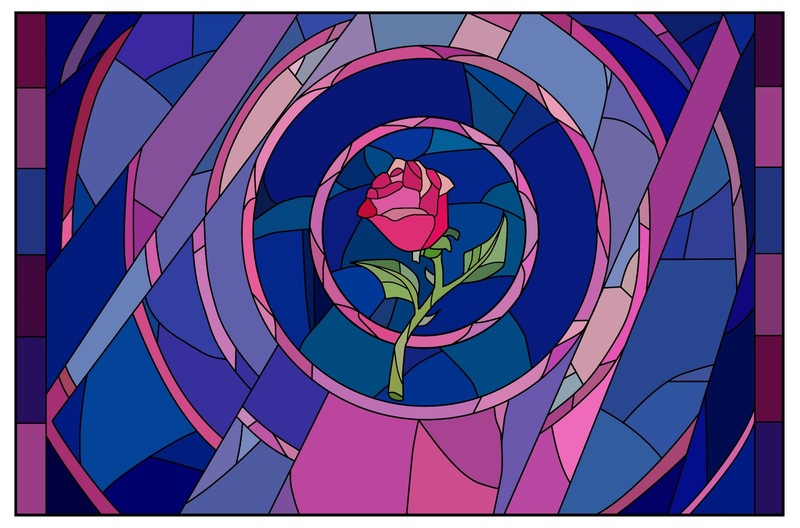 I love the rose rattle that Belle and the Beast find in her childhood home because, to me, it’s a sign that one day Belle will find herself imprisoned in a castle with a beast whose life is dictated by a wilting rose. The casting. Luke Evans is a phenomenal Gaston. I have no idea who Luke Evans is, but he nailed it! Emma Watson is more than fitting for Belle. Even the Beast is realistic and engaging. More backstory. In the remake, we learn about Belle’s mother, the Beast’s father, and the relationship between Gaston and LeFou. My personal favorite addition tells why the people forget about a castle near their village. I always wondered why no one knew about the castle, and the remake touches on that point. My favorite scene where this is evident is when the villagers storm the castle, and a few of them mention that the castle seems familiar to them. If you know me, then you know that I love anything relating to spiritual signs or past life memories. The Rose Petals. In the remake, whenever a petal falls, the castle crumbles away, and the servants get closer to becoming antiques. I think it’s a beautiful touch. And now, the bad, and most of my issues are dealing with books. No bookstore. In the remake, she goes to the Church to find a book. I understand the point they’re making, but I love that in the original, she gushes about her favorite book to the only person in town who will listen to a strange outcast who loves to read, a bookstore owner. And of course, a few sheep. Maybe they changed this bookstore scene to create the scene with Belle teaching a young girl how to read. If that’s the case, then the sacrifice is admirable. Gaston persuading Belle. In the original, he comes to Belle’s home, takes off his mud-covered boots and slams his dirty socks on top of her book while ranting about how she will be as a wife to him and mother to their six or seven kids. In the remake, Gaston steps on cabbage in Belle’s garden. Now maybe this is to say that her life as a farm girl is over in pursuit of a new life, I don’t know, but I don’t like it. To a bookworm who cherishes reading over farming, it’s far more offensive and crude to destroy a book than a few heads of cabbage, even though we need food to survive. In the remake, she makes it clear that she isn’t fond of farming, so they really should have stuck to the original scene here. That library scene. I think it’s lovely that Belle and the Beast share an interest in reading. And I also understand that it’s impossible to recreate that immaculate library. But it isn’t the library’s appearance that bothers me; it’s how he shows it to her. And not one review has mentioned this point. NOT ONE! It’s that library scene that motivated me to write this review. In the original, the Beast finds himself falling for Belle and therefore he wants to do something special for her. So, with the help of his candlestick friend Lumiere, he decides to give her his library. He leads her to the room and tells her to close her eyes as he pulls open the curtains to reveal the best fictional place in existence, his library. In the remake, the Beast, in short, says, “yeah this is my library. It’s nice. Whatever. Let’s read this book.” No. Giving her that library was a highly romantic gesture that primarily attracts Belle to the Beast. I guess it has to change due to their shared interest in reading, but I prefer the original where she teaches the Beast how to read, further bringing the two together. That dress. Trust me, that Wardrobe had plenty of silks, so I don’t know why Belle’s dress is flimsy and cheap. It should be a silky, layered ball gown. My prom dress, which I bought because it reminded me of Belle’s infamous yellow dress, was higher quality than in the remake. And it was only $150 at most, I think. I don’t remember high school well. The point is, Belle should be wearing a far more elaborate gown. So that’s my take on the remake. I can see why people say it stays faithful to the original, but to me it’s choppy. To me, it feels like they took scenes and lines, then placed them elsewhere for no reason. But then again, The Beauty and the Beast is one of my favorite Disney movies, so maybe I’m simply more observant. Regardless, it’s worth a watch and I will more than likely buy it for my collection when it’s released on DVD.